Sailing the Whitsunday Islands is one of the quintessential Australian backpacker experiences, right next to four-wheeling Fraser Island, the largest sand island in the world. I skipped Fraser Island (for now), but knew I couldn’t pass up any kind of sailing experience. Booking for the Whitsunday Islands can be overwhelming – there are a lot of boats, each with different “personalities,” capacities, and activities. It can also be expensive. Most Whitsunday sailing trips range from $350-450AUD. I lucked out and booked a two-day, two-night sailing trip for a really awesome deal through the discount website bookme.com. All Whitsunday sailing trips take off from Airlie Beach, which has turned this marina town into a primetime backpacker spot. The boat I was on, the Mandrake, had been a racing boat for nearly thirty years before being converted to take guests around the islands. Since it can only hold 16 people, including crew, it’s quite a small boat and has a much more relaxed, laid back atmosphere than some of the larger boats. Sailing boats or catamarans like the Anaconda, New Horizon, Atlantic Clipper, and Tongarra hold between 26 – 55 people and the partying goes late into the night. I knew a party boat wasn’t for me (anyone surprised? ), so I was happy to be on the Mandrake with plenty of time for exploring and snorkeling. The boats take off from Abell Point Marina. The Mandrake had a departing time of 3pm, so once we had signed waivers and kicked our flip flops off, we boarded the boat. I know we were all surprised by how small the boat was – we couldn’t figure out where 16 people were going to sleep! Turns out, 16 people certainly did fit below the deck, in very, very tiny beds. I ended up being the last one to board the boat. Guess who ended up getting the bed right across from the two marine toilets at the front of the boat? That’s right… this girl. Not surprisingly, I spent almost all my time on the deck of the boat. On our first evening, we snorkeled parts of the Great Barrier Reef before the sun went down. Dinner was roasted chicken with potato salad and garlic bread. We watched the sunset, then stayed up sharing travel stories and talking with the crew. Craig was our skipper. He grew up in Airlie Beach and had been sailing for 30+ years. I learned later that he was a Master Mariner, the highest certification possible when it comes to sailing. He had some crazy stories, from sailing over 20’ waves to spending months at sea. Charlie was our deckhand, or deckie. He was from England and had been working in Airlie Beach for almost a year. As for the group on board, there were backpackers from Germany (half of them were from Germany… I have never met as many Germans as I have in Australia! ), England, Italy, the Netherlands, and Switzerland. We fell asleep early, which was a good thing because at promptly 5am the next morning, we heard the boat’s motor rumble to life. The sun was just beginning to rise over the islands and we had already set sail for Whitehaven Beach. When we arrived to Whitehaven Beach, we hiked to a lookout point then had three hours on the white-sand beach. Whitehaven Beach is unique because it’s a silica sand beach; it’s often voted as one of the most beautiful beaches in the world because it has the softest sand. We were on the beach by 7:30am – there was no one else on the beach except for us and it was stunning experience. I was thankful we got there so early, because by 11am, day boats had arrived and tourists were flooding the walking paths and beach. We spent the rest of the day sailing around and snorkeling. The snorkeling was good, but couldn't beat my snorkeling experience in Belize. We saw batfish, trevally, turtles, parrot fish, and beautiful coral. We also had to wear "stinger suits," which are full wetsuits because the jellyfish in these waters can kill you. The scariest one, the Irukandji jellyfish, is the smallest and most venomous jellyfish in the world. It is as small as your fingernail, invisible, and the symptoms don't set in until 45 minutes after you've been stung. The islands are beautiful, but also unique in a way because they aren’t your typical sand islands with a few palm trees. They are large, looming islands with forests and plenty of wildlife. There are 74 islands that make up the Whitsunday Islands chain. Because it’s a protected national park, only seven of the islands are minimally developed. The most interesting island that we moored next to was Hayman Island, a getaway for the rich and famous. It’s $7,000 a night, with a three-night minimum stay, and you must be staff or a guest to access the island. It’s where Katy Perry, Nicole Kidman, and the Kardashians vacation. The sailing and the views were beautiful, from the sunrises to the sunsets. I love being on boats, but I don’t know much about sailing or boat maintenance. Craig answered my questions about the boat and showed me how to steer the boat and which ropes let down the sails. It was relaxing to just take in the sun. Sunscreen is a must, and I’m lucky I haven’t burned since getting to Australia. We also drank tons of water. The food was good – Charlie was the cook, and we enjoyed our family meals. Lunch on Friday was wraps, then dinner was spaghetti Bolognese. He did a good job of accommodating vegetarians, and there were also plenty of snacks. My favorite moments of the trip were small ones. On Friday night, a few of us were gathered along the edge of the boat. We had borrowed Craig’s headlamp and were peering into the midnight waters. We could see the shadows of massive batfish and the occasional small, black-tipped reef shark. Occasionally we would hear a large splash not far from the boat, and we all took wild guesses as to what it could be. At one point, Craig peered over the side of the boat with the headlamp. A massive shadow disappeared under the boat and we caught a glimpse of a dorsal fin. “Don’t say anything,” Craig whispered, “but that wasn’t a reef shark. That was a huge tiger shark. They hunt at night for the sea turtles.” Not surprisingly, some of the girls didn’t want to go snorkeling the next morning! On Saturday, I was the first one awake at 6:30am. I quietly climbed to the deck of the boat, and had the morning view all to myself. I haven’t had coffee since I’ve been in Australia, but at that moment, I wished I had a tall, black iced coffee and a blueberry muffin. A little slice of home out on the reef in Australia. Instead, I drank more water and waited for breakfast to be set out. After enjoying breakfast and calm seas, we pulled back into the marina at noon. I loved the overall experience, the crew, and the group I was with. The accommodation was very tight and somewhat uncomfortable, which was my only challenge with the boat. Even though I love sailing, two nights on that boat was enough for me because it was just too small. An old racing boat just wasn’t built to hold 16 people. 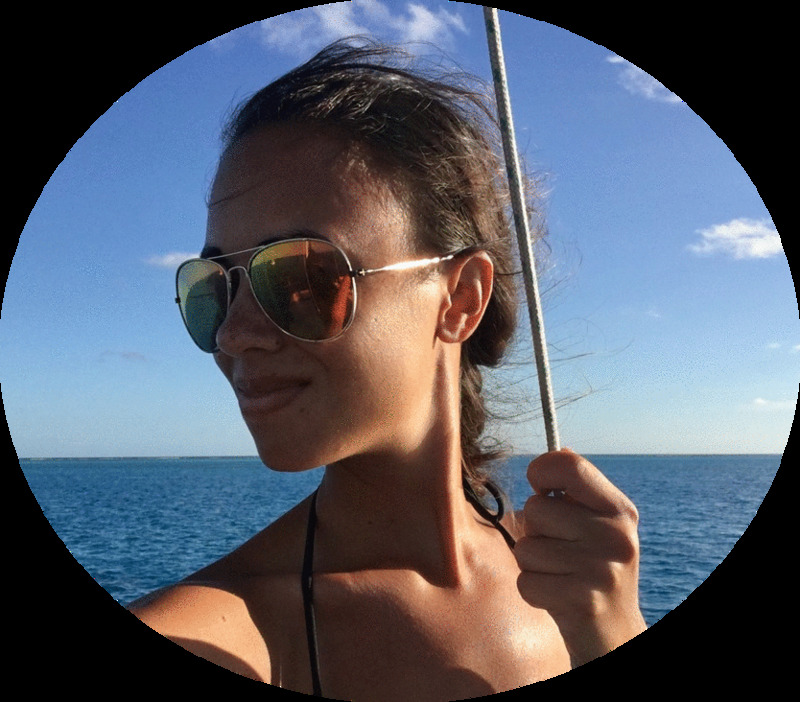 My sailing trip in Belize continues to be my most memorable sailing experience because of the marine life and the camping, but overall, sailing the Whitsunday Islands was amazing and I loved being back on the water again. Which is good, considering I’m working on a catamaran starting December 3! Here’s to many more sailing adventures ahead.